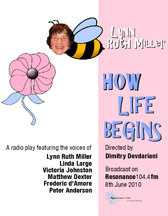 I met Lynn Ruth Miller for the first time four years ago during the Edinburgh Fringe. Her show, Farewell to the Tooth Fairy touched me deeply but I realised that her wonderful stories require bigger audiences and deserve to be heard again and again. That's why I offered to create for Lynn Ruth a play that would be based on her autobiographical stories, and that would involve supporting actors who would portray various people in her life. Lynn liked the idea, but it took us four years to make this project happen. And finally it did! The play was recorded for and then transmitted by the Resonance FM. I cannot thank enough the staff members of Resonance FM for their support and enthusiasm that made How Life Begins into what it is. We are now planning to start working on the scenic version of the same play which is going to be expanded with the addition of a few more stories recently written by Lynn Ruth. These are stories about a young girl from an immigrant family finding her feet in a new and strange country, becoming a person, a woman, an artist, fighting her misfortunes and obtaining her own unique voice as an individual, both in art and in life. The stories are moving, filled with humor and sadness, and are very profound and honest. Lynn Ruth MIler, known in the UK as a comedienne shows her writer's talent, and what an incredible writer she is! The cast: Lynn Ruth Miller, Matthew Dexter, Linda Large, Victoria Johnston, Frederic D'Amore, Peter Anderson.